If you have favourite recipes you would like to share with your neighbours in Grampound, please let us know. Either email to shop@grampoundvillagestore.co.uk or hand to Kevina in the shop. We will publish them here. Please buy as many ingredients as possible from GVS! Some of our favourite recipes. This is the first cake (and the same recipe) my mum taught me to make, I was probably about 11 years old at the time and it gave me a lifelong interest in baking. Once a sponge cake has been mastered then it becomes a master recipe for many variations and different occasions. It makes a lovely cake for tea, a birthday cake for all ages, a cake to sell at the school fete and dare I say a cake to show off to your friends. Click below to download the complete recipe and enjoy! This has become a popular breakfast in our house since the Grampound Village Store opened. All ingredients available in store. Split the roll and toast lightly under a grill if desired. Fry the egg until well cooked. Place egg in roll. Place a spoonful of Hollandaise sauce on the top of the egg. Close roll and serve. 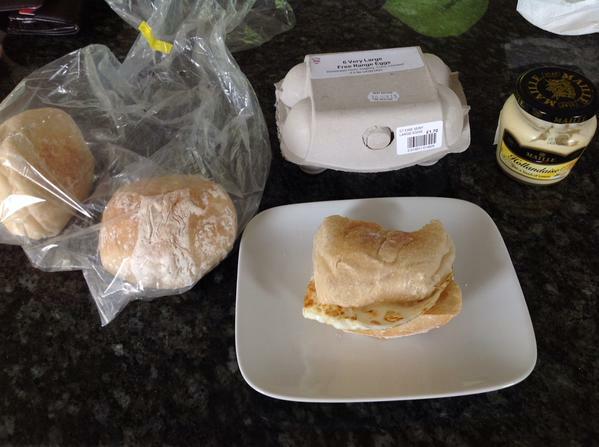 Half-eaten bread roll I prepared earlier ... with the ingredients displayed.